Founded in 1989, Sky Blue Credit Repair’s 24 years of experience in the credit repair industry gives it the ability to effectively help their customers remove negative items from their credit reports. Sky Blue Credit Repair’s record speaks for itself. Customer service comes first with Sky Blue Credit. A dedicated team is there to help so you don’t have to navigate the complicated and daunting process of credit repair alone. Once your credit reports are obtained from each of the three major bureaus, Experian, TransUnion and Equifax, and some personal information is provided, Sky Blue Credit Repair will review them line-by-line, designate any items that need immediate attention, and send dispute letters where appropriate. As the credit bureaus respond to disputes, Sky Blue Credit Repair will process and monitor the responses, as well as track and provide you with updated credit scores after successful removals of negative marks. Why Choose Blue Sky Credit? Sky Blue Credit Repair employs the best in the industry to work through your credit. Beyond disputing negative items, they will also provide a comprehensive review of your reports and provide suggestions for how to raise your FICO score. Sky Blue Credit Repair’s knowledgeable staff will provide unlimited support and will continue to fight to clean up your credit reports. They will continually track your disputes and are up to date on current law. 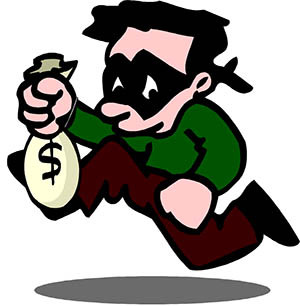 Sky Blue Credit Repair’s monthly service costs $59, in addition to a one-time $59 setup fee. For that low monthly fee, Sky Blue Credit Repair will work diligently to clean up your credit and to improve your credit score with each of the three major credit reporting bureaus. They also offer a “couples” discount. If you decide to enroll in the program as a couple, Sky Blue Credit Repair will offer you a 50% discount on your monthly fees. Sky Blue Credit Repair is a leader in the credit repair industry. 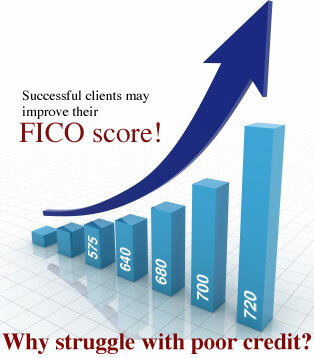 With almost 25 years of experience, the team will work hard to help raise your credit score by removing negative items. They offer a competitive rate and have an A+ rating from the Better Business Bureau. Rest assured, you’ll be working with a staff that has seen it all if you choose Sky Blue Credit to help improve your credit. Thank you for reading our Sky Blue Credit Repair review. I went with a cheaper company and was totally scammed. I was fearful all credit repair companies were just out to take my money and my trust until I found Sky Blue Credit Repair. They have an A+ rating with the BBB so I thought I would give it a try. I needed help to clean up my credit report. They were great! They followed through on what they said they were doing to do in a timely manner. My credit is on the road to recovery thanks to the help of Sky Blue. I loved my experience with Sky Blue Credit. I was embarrassed by y low credit score but they helped me remove the wrong items and increase my score by almost 70 points. Thanks sky blue. I wanted to propose to my girlfriend but knew I couldn’t go into a marriage with such a messy credit report. I mean who wants to marry someone who cant qualify for a loan and causes things like car insurance to be super expensive? I just didn’t know where to start. 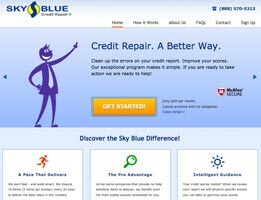 I was talking with a buddy when he told me he was working with a company called Sky Blue Credit Repair and they were awesome. So I thought I would give it a try. I am very happy I did. My credit is on its way to recovery and I am on my way to the alter! I didn’t know what to do or how to do it or where to turn. Sky blue helped me dispute the incorrect things on my credit report and took control of my case but still kept me informed. Their online access is great and I actually got excited to track my progress. Great experience with a not so fun subject matter. Sky is simply the best. Stop looking now and just do it. I panicked when I saw my credit report! What were all these ae payments and crazy things and how do I change them? The answer is Sky Blue. Everyone said I should just do it myself but I am glad I went with my gut and worked with them. They truly are experts but they also really care about there clients. In 6 months, 7 negative items have been removed and Sky is working on 3 more. I cant wait to see what my credit score will b at the end of this whole deal. I love Sky Blue! I am way too busy to handle the communication required to clean up my messy credit report yet I know how important a good credit report and score are to so many things. My sister used Sky Blue Credit Repair and highly recommended it so I thought what the heck. I could use the website to check in on the progress when it was convenient for me and I did not have to be too involved. I love things where I can sit back and watch things happen! Sky Blue put their money where their mouth is so to speak and helped me clean up my report and raise my score. I loved my personalized online page and their proven results. 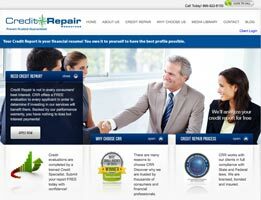 I think everyone should use creditrepair.com because it is so easy and effective. I have told numerous friends about my experience because it is much easier to face the three big credit bureaus with creditrepair.com handling the situation. One word – app. I love that I could monitor my case mobily since I travel extensively. 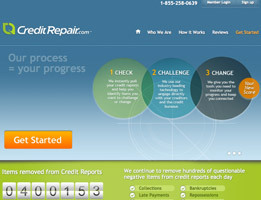 Why don’t all credit repair companies have this technology? Great results with ease. I had a ton of debt after my divorce. I was already depressed, but knowing I had nearly $100,000 in debt just made things worse. I struggled with my emotions and my debt for about a year before I decided to give up. A friend of mine recommended me to Sky Blue Credit. He told me to give it a try, and if I didn’t see results he’d buy me a steak dinner. I was impressed with how empathetic the staff was. They really were working hard so that I could get some relief. And by the way, I never got my steak dinner. Sky Blue Credit helped me during a very rough time. I just wanted my debt to go away. It was holding me back. I felt like I was chained to it. I was trying every method possible to get rid of it. Nothing seemed to work. I finally decided I couldn’t do it on my own. I needed professional help. So I did some research. I found Sky Blue Credit. I had so many questions. They answered every last one. Once I gave them my information, they got to work. Now, 8 months later, I’m heading to Hawaii to celebrate a clean credit slate. Sky Blue Credit is the best company you could hope to work with when cleaning up your credit. Sky Blue Credit shows mee how to reduce credit debt for the long haul, not just nip it in the bud right now. This will help me in the future with money management. Using Sky Blue Credit for a year, I can tell you my credit is in a totally different place than this time last year. I am floored at how much of a difference Sky Blue Credit has made for my credit score. It is a major accomplishment for me to be in a place where I’m carrying zero debt. In my family it is very normal for people to never own homes and for credit to be a way of life. I really do not want to be in this predicament the rest of my life which is why I called Sky Blue Credit. My girlfriend used Sky Blue Credit after getting a divorce to clean up her credit. When I called Sky Blue Credit the rep was honest with me and said it would be a long process since I was carrying a lot of debt. It has been a year and my credit score has gone up almost 250 points and puts me in a great place to start looking for a home as I continue to save towards my down payment. I want to put down about 25% and I am thrilled to be a position where this is a reality. I am not carrying zero debt and have one credit card for emergencies only. I wasn’t so happy when I saw my credit report before applying to move apartments. Yes, even apartments are now pulling your credit report before they approve you to move in which is so annoying considering you will likely have first and last month’s rent ready to go. Anyway, I had to move out of my neighborhood for personal reasons and that meant calling Sky Blue Credit. I was so glad they broke down exactly how much I would pay per month to be out of debt in a little over a year. My score is already improving and it’s because of Sky Blue Credit! I found Sky Blue Credit online. I’d looked at a few different credit repair companies and Sky Blue Credit stood out because of the awesome reviews I read. I called them to see if it was as great as everyone said and I can say with full confidence, these people are the most honest and helpful people I’ve ever met. I am happy to see my credit card payments reduced. I am paying less because Sky Blue Credit negotiated lower rates and I will be out of debt within a year. That is music to my ears after struggling with debt for over five years. Thank you Sky Blue Credit. I had great credit, until my divorce left me holding the bag on a lot of the joint debt with my ex-husband. He didn’t fulfill his obligations, and I still had to deal with it while we battled in court. Needless to say, Sky Blue Credit came to the rescue and helped me get everything back in order, and I am back on top again. It was long and stressful, but the support I got from Sky Blue Credit was absolutely priceless. After telling my friends and family about the experience, they have all decided to work with them to get their financial house back in order. The team at Sky Blue Credit is professional and caring. At first, I was worried that nothing with my financial situation was really going to change. 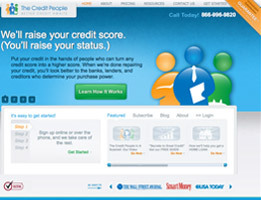 But after just a few months, I noticed some deletions on my credit report and I have Sky Blue Credit to thank for that. I had credit cards to help me with emergencies, and to use them when something hit between pay days. 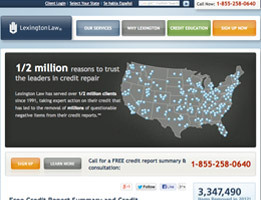 I was always responsible with them, and never thought I would need help from credit repair companies. After an unexpected job loss, even with savings, I couldn’t handle the obligations before I was able to find a new job. Lost about how to do it on my own, I found Sky Blue Credit. After working with them, I was able to restore my credit score, pay off the debt, and keep all my creditors happy. It was worth every dime I spent on the service. My husband and I wanted enough money to pay cash for it. You get a brand-new bed, but we did not have we decided to invest in a higher end bed because we had so many back problems and our cheap mattress just wasn’t cutting it anymore. When we went into the furniture store and applied for the credit to get our mattress, we were shocked to find that we did not qualify for any kind of financing or payment arrangements because of how bad her credit was. It turns out some things were going on that we didn’t know about. With the help of Sky Blue Credit, we were able to get the issues resolved and restore our credit score to its moderately good standing. Though it to the little wrong or than we originally wanted it to, we were able to go back to the master storing get the bed we wanted on credit terms that we were happy with. If it were for trying to get the bed in the first place, it could have been several more years before we even realized there were problems with our credit, but it would’ve taken even longer to fix without Sky Blue Credit’s help. What I liked most about Sky Blue Credit was that I could pretty handle everything online. As a busy student with a full time job, I knew taking care of my credit was important, but I did not have much time to be on the phone. I set my account up online and Sky Blue Credit was off to the races!